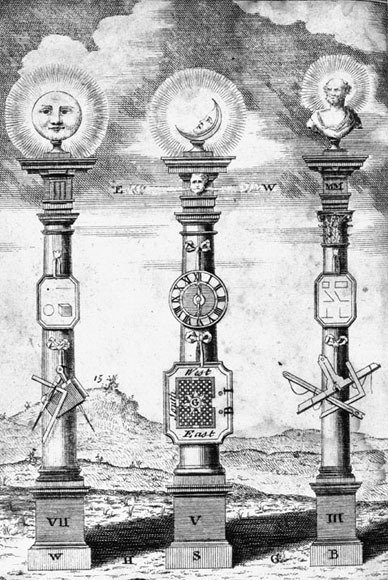 Today in Masonic History we discuss the Ancient Landmarks of Freemasonry. Ancient Landmarks of Freemasonry are considered unchangeable and are often used to define Freemasonry. The idea of an Ancient Landmark is said, by some, to refer to the Bible. In the Book of Proverbs it states "Remove not the ancient landmark which thy fathers have set." There is also presidence in Jewish law that states "Thou shalt not remove thy neighbors' landmark, which they of old time have set in thine inheritance." In either case it refers to an area of land that may have stone markers used to define the property. Relating it to Freemasonry, the landmarks define the due bounds of a lodge, Grand Lodge or Grand Orient. It should be noted that I will use the term Grand Lodge generically from this point forward in this article, it is meant to refer to a Grand Lodge or a Grand Orient. It is important to note that since Freemasonry has no controlling authority, individual Grand Lodges may vary in which Ancient Landmarks are recognized. Some Grand Lodges may recognize as few as three and others may recognize as many as 40, sometimes more. In 1723, in Anderson's Consitutions it was stated that "Every Annual Grand Lodge has an inherent power and Authority to make new Regulations or to alter these, for the real benefits of this Ancient Fraternity; provided always that the old Land-Marks be carefully preserved." In the original book it did not list the Landmarks. In the 1950's the Commission on Information for Recognition of the Conference of Grand Masters of Masons in North America upheld 1and 3 as landmarks. They also added that "Discussion of Religion and Politics is prohibited in the Lodge." The Conference of Grand Masters of Masons in North America is an association of Grand Lodges that have some level of amity with each other. They get together annually to discuss issues that may effect all of the Grand Lodges in the region. There are other such conferences around the world with a similar purpose. Although the Conference did uphold those three landmarks, there is no obligation for any Grand Lodge associated with the confrerence to uphold those specific landmarks. The Conference should be thought of as a "United Nations" where individual Grand Lodges are represnted, but the Conference has no authroity in the individual Jursidictions.